There’s something about being on the Coast of California that inspires us all to appreciate the seaside gifts that nature has given us. 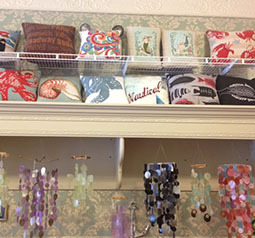 Our line of shells and nautical decor prompted us to look at things around us in a way that we didn’t see before. California’s majestic mountains framing the Pacific ocean, beautiful boats in the harbors, palm trees and tiled roofs, sun-dappled flowers and shrubs in February made us feel inspired! The emails and comments from our customers tell us that you, too, have been inspired by these “gifts of nature.” In the past, we’ve had lots of requests from brides-to-be to help them create and plan a coastal motif for their weddings and receptions. We work with customers, present our product lines in keeping with a coastal look for our seaside brides and their wedding coordinators. We use our custom products, like shell centerpieces and place card holders, flower lights, attendants gifts, shell lettering, favors, toasting glasses, seating decor, cake toppers, ceremony accessories, even Vintage touches. Working with the bride from inception to reception, from decor to favors, Candy’s Cottage Weddings will make her day unique, special and inspired! Our creative wedding ideas in this coming bridal season will offer even more convenient bridal planning for you! And if you’re local to Southern California, or planning a destination wedding here, we can present these wedding themes in person too. If you don’t see it, we do create custom pieces that will set you and your wedding apart from the rest! So let us know what inspires you! Hello from The Sunny West Coast!!!! Here we are in sunny Southern California! In between unpacking, we have been sightseeing the coastal towns and enjoying the mild winter weather, of course. Wow! What a place to get nature’s inspiration all year round! And happily, we will be having a sunny and warm Christmas! The coast-to-coast move was daunting and hectic, but it was great having a built-in support group called Family! It took a few months to wade through the myriad of boxes and bins and in fact, the garage is still full! It seems that moving the New Jersey store to Southern California is a gargantuan proposition! But in the coming months I’ll be looking for a storefront, a “brick and mortar” base of business, so I can meet many of our customers in person. That will be fantastic! As always, our busy online shop is still full of your favorite selections, like made-to-order shell creations, jewelry, accessories, barware, signs, even custom home décor. Right now we have lots of hand-made shell and natural Christmas decorations. In fact, check out our Etsy shop at www.livecoastal.etsy.com offering our hand-made items. You can also find Candy’s Cottage on Instagram and be sure to Like us on Facebook! Wishing all of our loyal customers and fans a wonderful Holiday season and best wishes for a healthy and prosperous New Year ahead! It’s hard to believe – they’re here already! Holiday 2014 is upon us! 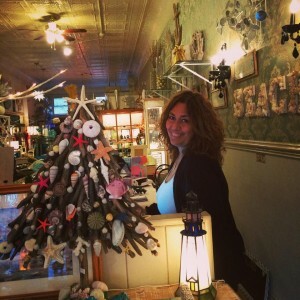 Here at Candy’s Cottage, we are fully stocked with wonderful gift items, coastal home decor and unique finds to fill all your seasonal needs! Whether you need gifts for your beach house, coastal decor theme, or just a special gift for a friend, we have a wonderful selection to choose from! Our custom signs continue to be a hot seller – perfect for that hard to buy for person (we all have at least one in the family)! We can do any town name, with a longitude/latitude, or any phrase that is apropos for you! 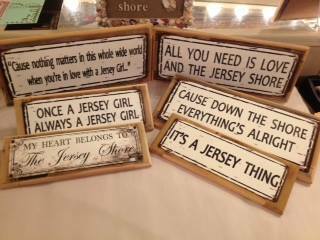 Here in New Jersey, we sell lots of “It’s a Jersey Thing,” “Jersey Girl,” as well as Bruce Springsteen-inspired lyric signs like “Cause down the shore everything’s alright.” Be creative with that friend that has everything – our signs are “shore” to please! Also very hot are our Monogram and Name Necklaces. Handcrafted out of 925 sterling silver, we have single letter monogram necklaces and triple letter monograms in sizes from small to large. Simply stunning and so unique! Also available are name necklaces – we can put up to 6 names on a necklace! This is THE perfect gift for moms and grandmas who want to proudly wear the names of their kids! Lastly, we have pretty, colorful acrylic monogram necklaces in five different colors on sterling chains for a striking accessory to any outfit! Check out our new line and order soon for the holidays! This holiday season, come visit us at our new location in Red Bank! Or if you can’t, we are always open at candyscottage.com! Summer at our new location – Red Bank, NJ! It is Summer 2014 and we are celebrating the season right here at Candy’s Cottage – but at a new location! We recently moved to 28 Monmouth Street in Red Bank and couldn’t be happier in our new neighborhood! There’s lots of great shops and restaurants in the area, and it’s fun to constantly be around the excitement. We have some new additions to the store, including a plethora of funky, coastal pillows, fun signs, shabby chic furniture, and embellished products with shells and starfish. We have a ton of new jewelry too, like our line of monogram necklaces, trendy midi rings, and Alex and Ani-inspired charm bracelets. As always, we are available to customize any item you’d like with shells, starfish, and nautical embellishments. This week, starting from 7/19 to 7/26, we have a new promotion going on! We are introducing our new “whisper word!” At the register at your time of purchase, whisper the words “beach bum” and receive 10% off any one item of your choice. Make sure to take advantage of this fun, new sale all this week! Come visit us at our new location, or if you can’t – we are always open at candyscottage.com! New Rhinestone Nautical Jewelry Debuts Today! New at Candy’s Cottage is our fabulous line of rhinestone nautical jewelry! We have quite an assortment of coastal inspired earrings and necklaces that are all stunningly pretty and perfect for summertime or anytime! Check out the gorgeous silver and gold tone starfish, seahorses, sea turtles, anchors, whales and mermaid jewelry. Loaded up with lots of gorgeous crystals, each piece will bring a piece of the beach home to you! We also have lots of fun everyday styles with the same fabulous rhinestones, such as crowns, music notes, crosses, and peace signs. Perfect for the person who has coastal or beach decor, our jewelry is the finishing touch to a perfect gift! So take a look at our gorgeous line of necklaces and earrings today! It’s Fall Already? Summer is history…. The beaches are jammed, the temperature is way up, so it must mean summer is in full swing! Here at Candy’s Cottage, we are busy with lots of customers, beach goers and tourists stopping in to check out all our new merchandise! This time of year means lots of parties, beach days and backyard BBQ’s, and we’ve got all the essential fun stuff to keep the party rolling! Lots of coastal barware with fun designs like etched starfish, palm trees and fish complement your wine, martini or beer much better than a plastic cup!! Our great aluminum coastal-themed serve ware is the perfect way to dish out your summer fare. I really love our aluminum boat server with two spoon “paddles.” I had a customer buy it for a big summer party and she put shrimp, cocktail sauce & lemons in each of the compartments. She said it was the hit of the party!